Let me get this out of the way: I hate my chair. It’s a bargain-bin piece of junk that I got from one of the big chain department stores, and I’m pretty much marking time until I can afford the upgrade to something a little nicer. In the meantime, I make do. My chair does everything I need from a chair: it lets me sit on it, and it rolls along the floor. Until today. I’ve been having a rough roll lately when I get up from my desk, and today one of the casters hard-locked on me and the chair almost flipped over. After prying it out, I realize it’s got a huge knot of carpet fuzz, cat hair, and who knows what else in there from years of use. It’s new caster time. How big is the original caster? What kind of floor will the caster be used on? In my case, I’m currently on hardwood floors. For hard surfaces like wood, chairs mats, tile or linoleum, a soft wheel is recommended. Hard wheels should be used on soft surfaces, like carpet. Just like any other wheel, really. Think about it: soft rubber car tires for the hard concrete road, but hard plastic tires on your lawnmower for moving over soft dirt and grass. But I digress. By plugging the length, diameter, and floor type into the “Narrow your Results” column on the casters page at OnTimeSupplies.com, I found the best match for me would be these Doublewheel Nylon Casters from Master Casters. They come in a set of five so I can either replace the whole chair’s worth (and have one left over!) or replace the bad one and keep the rest in reserve for the day the other wheels inevitably lock up on me. Not too shabby, and it beats replacing the whole chair. So there you have it. Proof once again that shopping for office supplies and equipment doesn’t need to be a hassle. Something as simple as finding a new caster was turning into a pretty hair-pulling exercise, and hopefully the above guide will spare a few shoppers that grief. Good to know how to measure a caster in case an of the office chairs I buy breaks. What a creative post! 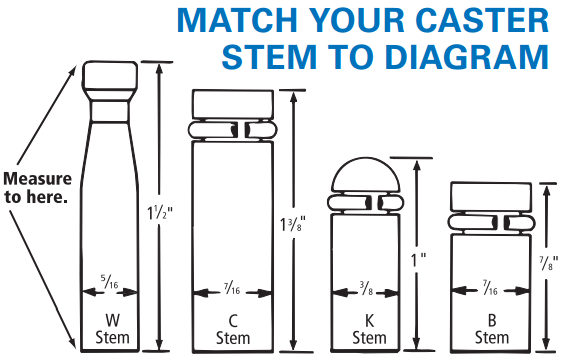 Thanks for making measuring for a caster so easy (& so funny!) – love the graphic image too! It is a great post. this blog is awesome.Posts with more information will be great.thanx alot.. I have FINALLY gotten around to buying this chair after reading your post all those months ago. Thanks so much for the detailed post, really made me think about what would be right for me. So glad to hear you found the article helpful! Enjoy your new chair!